We’ve got five easy ideas for transforming your bathroom, most of which can be done in a weekend or less. We’ve changed up a standard bathroom to give it a relaxed, slightly rustic holiday vibe. Here’s how we did it. In many ways the bathroom is the most ‘fixed’ of all of our rooms. The basic kit – bath, shower, WC and basin – are a hassle to change and tend to define the look of the room as a whole. But in such a small space a few changes go a long way. We’ve got five easy ideas for transforming your bathroom, most of which can be done in a weekend or less. In this image we’ve changed up a standard bathroom to give it a relaxed, slightly rustic holiday vibe. Here’s how we did it. Most modern bathrooms are pure white, and with good reason. It gives a light feel in a small space and it’s less likely to date than those avocado suites of the past. However white can look a bit clinical and, well, boring. All you need is to add the lightest of colour touches to spice things up a bit. We advise that you pick just one colour so as not to overpower the space. It could be something bold like hot pink or a very subtle stone shade. Carry it through items like towels, rugs, window dressings and even little details like the soap dish for an instant update. The bath is generally the single biggest block item in your bathroom, so changing it will have a big impact. In this room we painted the exterior of a classic roll-top bath to give it a totally new feel. To paint the outside of a cast-iron bath you’ll need to sand the surface, then paint with an oil-based metal primer before adding 2 coats of oil-based paint. You can also paint an acrylic bath by sanding and prepping with 3 coats of primer followed by an acrylic polymer paint. Got a fitted tub? Then consider fitting an MDF bath panel that you can paint any colour you wish. A plain tiled floor is probably best left alone unless the pattern is truly unbearable. But if you have a wood, lino or vinyl floor then an update can be easy and pretty low-cost too. Vinyl floor tiles have a reputation for being naff, but with companies like Harvey Maria bringing in named designers to create cool contemporary prints this affordable option now looks more appealing. A wood floor can also be transformed with a few coats of tough floor paint – changing from wood to white can lift the whole space. See you colour or theme vision through down to the last detail by adding new accessories. For the bathroom above we ditched the chrome towel rails for a bamboo ladder, giving a more organic feel. 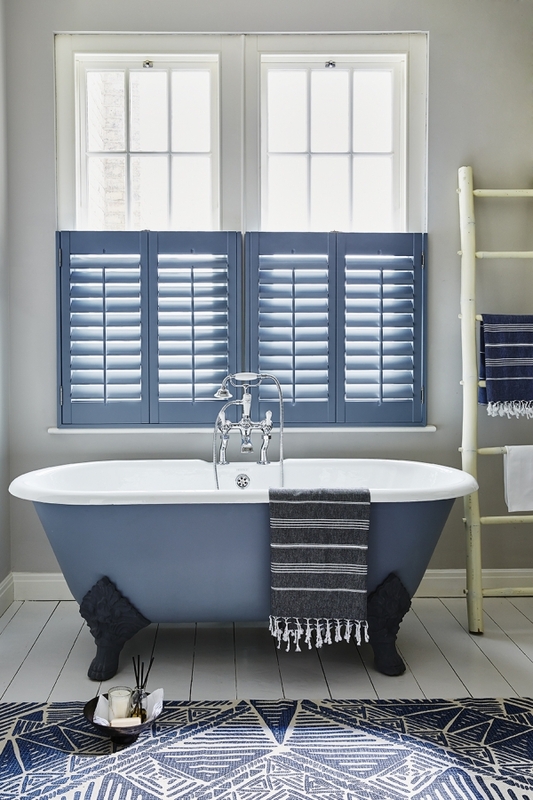 For a vintage look a freestanding antique towel rail would do the trick. Think your theme through on everything from the bath mat to the medicine cabinet and your bathroom will look different with no more effort than a trip to the shops.